Paola Ricciardi, Raman Spectroscopy for the Non Destructive Characterization of Ancient Pottery, Porcelain and Mosaic Glass, Firenze, Università degli studi di Firenze, 2007. This thesis is in the first place an “adventure” in three domains of application of Raman spectroscopy as a diagnostic tool for the non-destructive study of cultural heritage materials, namely ancient pottery, porcelains and mosaic glasses. While the use of this technique is well established for the analysis of historic pigments and precious stones, its application to these three types of materials is more recent and still an expanding field. The first chapter illustrates the main objectives of the use of scientific techniques for the analysis of these kinds of materials. It also contains a synthetic review of how Raman spectroscopy has so far been applied to archaeometric studies on cultural heritage materials, and specifically on ancient pottery, porcelains and glasses. The research strategy and the organization of the thesis have been based on this review. Chapter 2 provides a brief introduction to Raman spectroscopy, with its advantages and limitations, as well as a description of the instrumentations and data processing methodologies used. Chapter 3 includes three different experiences regarding the application of Raman spectroscopy to ceramic materials, both in the form of ancient artefacts and of modern test samples. In all cases this technique was combined with other analytical methods, in order to provide information on the raw materials and/or on the production processes of ancient pottery. Chapter 4 constitutes the most voluminous part of this thesis. It deals in general with the potentials of a Raman study of porcelain, and more specifically with the characterization of the 18th century productions of the Bourbon manufactures of Capodimonte and Buen Retiro, through the analysis of both excavation fragments and intact objects belonging to the Sèvres Museum. Raman analyses confirmed the uniqueness of the Capodimonte production, and specific Raman signatures were identified for pastes and glazes, which might serve as a “reference” group for the identification of products issued from this manufacture. High similarities were found with the Raman signatures of some Buen Retiro samples, which would assign them to the early stage of the Spanish production. On the other hand, other Spanish samples belonging to later periods of the same factory display peculiar signatures both in the paste and in the glaze. The acquired data could be further treated, in order also to investigate more deeply the correlations existing between the results of Raman analysis and those obtained from other (destructive) techniques. The data presented in this work will hopefully integrate those relative to a number of other early European productions of porcelain which have so far been published. Such a large corpus of spectroscopic data needs now to be systematized, in order to identify “reference” Raman signatures for each manufacture and possibly to standardize the experimental procedure for Raman analyses on ancient porcelains. Up to now a similar need has been fulfilled for the Raman spectra of pigments, which have been the object not only of many publications, but also of some systematization and implementation over the internet. Hopefully the establishment of such a database and experimental protocol will be the object of more research in the near future. Chapter 5 details the results of a preliminary Raman study carried out on Roman age mosaic glass tesserae, which allowed a good characterization of both the glass matrix and the crystalline inclusions. It also led to the identification in some blue, turquoise and green tesserae of calcium antimoniate, whose Raman signature does not seem to have been recognized so far in the scientific literature on mosaic glasses. Moreover, the extreme homogeneity of the Raman spectra of all the ancient samples well reflected the limited variability of their chemical composition, and gave yet another proof of the high level of standardization of glass production in the Roman Age, through a completely non-destructive analytical approach. These were then the reasons of interest and the main results obtained in the three chosen domains of application of Raman spectroscopy; while dealing with different materials, they are far from being “stranger” to each other. In fact, we deal with colouring agents used as pigments in the decoration layers of ancient pottery and porcelain, as well as in bulk glasses. Also, pottery and porcelain glazes have the same material structure as mosaic glasses, and therefore the treatment of their Raman spectra is exactly the same, and similar kinds of information can be be extracted for glazes and glasses. Needless to say, these three types of materials are often found together in historical and archaeological contexts, or even in the same work of art (such as ancient mosaics, often realized using both ceramic and glass tesserae), and may therefore suffer similar pollution and degradation conditions, or need to be jointly analyzed and restored. Studying such different types of materials actually allowed making some comments on the importance of choosing the “best” Raman instrument for the analysis of each of them. Different spectrometers were used, allowing testing different laser colours, instrumental optics and filters. Macroscopic and microscopic approaches were compared, and a last generation portable Raman spectrometer was used for the on-site analysis of some porcelain museum objects, demonstrating its high-standard performances, fully comparable with those of lab instruments. Generally speaking, this work showed once again the usefulness of Raman spectroscopy for the non-destructive analysis of cultural heritage materials. More particularly, its capability to characterize glassy structures should be underlined. Further results could be obtained by enlarging the set of samples of which both the chemical composition and the Raman spectra be known. This may in fact improve the correlations established in previous works and in the present thesis. This would in turn enhance the reliability of Raman spectroscopy and support its role as a routine technique, both fast and non-invasive, useful for preliminary screenings of large numbers of artefacts. At the same time, it seems important to proceed to a standardization of experimental procedures and data processing methods, in order to facilitate comparisons among results obtained in different labs. Os textos das comunicações apresentadas na conferência Retablos: Técnicas, materiales y procedimientos, que se realizou, em Valência, em 2004 e que estavam disponíveis em CD editado pelo Grupo Español del IIC, forma agora colocados online. Miguel Angel Corzo, Mahasti Afshar (ed. ), Art and Eternity. 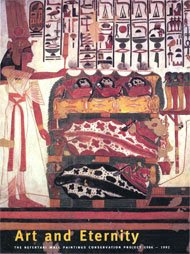 The Nefertari Wall Paintings Conservation Project. 1986-1992, Los Angeles, The Getty Conservation Institute, 1993. Acabou de ser publicado o 10.º número da revista digital e_Conservation, com data de Junho de 2009. Está disponível aqui. Acabou de ser publicado o primeiro número de 2009 da revista Restaurator. Os artigos estão disponíveis aqui (acesso condicionado). Acabou de ser publicado o 3.º número de 2009 da revista Journal of Cultural Heritage. Jørgen Wadum, Technical Art History: Painters' supports and studio practices of Rembrandt, Dou and Vermeer, Universiteit van Amsterdam, 2009. Nos dias 16 e 17 de Julho irei realizar um curso intitulado “Preparação de artigos e uso da bibliografia em formato digital em conservação e restauro”, organizado pelo Departamento de Arte da Escola das Artes da Universidade Católica Portuguesa, no Porto. O curso, com a duração de 11 horas, decorrerá no no pólo da Foz da UCP. O curso retoma alguns dos assuntos abordados em cursos organizados pela ARP - Associação Profissional de Conservadores-Restauradores de Portugal, realizados em Lisboa em 2007 e 2008.